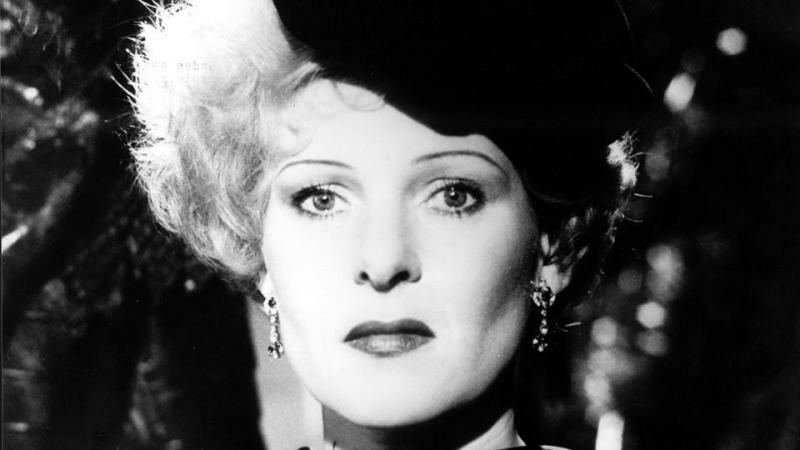 When I first saw Fassbinder’s Veronika Voss in 1982, I had been living in Berlin for nearly 18 months. I was captivated by Rosel Zech as the washed-up eponymous film star, just as Robert, the reporter in the film who chances upon her in a bar, is also captivated by her residual beauty. Shot in black and white, the film is set is in the mid-50s. Veronika reminisces to Robert of a time before the war, when her fame shone brightly; but in the new post-war West Germany she is all but forgotten, broke and drug-dependent. An echo, surely, of Gloria Swanson in Sunset Boulevard. Veronika is a patient of the nasty and parasitic Dr Katz and her accomplices, who keep Veronika dependent on morphine, take possession of her will and drain her of her wealth until she has nothing left. Their clinic is all clean white and glass; indeed, the other patients wait behind walls of glass. The clinic could be seen as an allegory of the chilling, clean aesthetic of the new West Germany. Zech plays Veronika Voss with compelling melodramatic tragedy, subsisting on the self-delusion of a past grandeur that was in fact Nazi Germany. She brings a luminosity and depth to what is, frankly, a shaky and porous plot. Robert uncovers the truth behind the façade of the clinic and, assisted by his journalist sidekick Henriette, they seek to rescue Veronika. But it goes wrong: Henriette is killed and Veronika, trapped by her dependency like a pinned butterfly, is abandoned by the quack doctors. Without morphine, Veronika takes an overdose of sleeping pills and is found dead a few days later. Fassbinder’s films often featured the mannered and decadent in moments of decline. His characters are caught up in their own obsessions and self-delusional needs; they echo our own fears. Fassbinder himself was often terrified of failing utterly. Zech claimed it was a mystical experience working with Fassbinder: ‘He was giving something away all the time,’ she said, ‘you felt loved and cherished’. Veronika Voss won the Berlin Film Festival Golden Bear award in 1982. Fassbinder’s death shortly afterwards – like Zech’s character, from an overdose – was a blow to Zech, who had envisaged further collaborations. Instead, she retreated into lesser roles on German television and never again hit the heights she had achieved with Fassbinder and Veronika Voss. Zech’s name became so synonymous with the film that she found herself frequently reminding people, ‘I am not Veronika Voss’.